Weather woes, creepy blokes and never using the elliptical again! I’ve been feeling quite sad about my Dad this week. He was diagnosed with cancer in 2011 and by the time he died in 2012, I’d gone from being a confirmed non-runner to having completed one 5K and three 10K races. He wasn’t much of a runner, rowing was more his thing, but as such he understood the pressure, the misery, the satisfaction and the joy of training for races. I really miss talking to him about it all and wish he was still here to see me do this. I expect I’ll be thinking about him a lot over the next four weeks. This week has been a bit up and down really. I had a slightly dodgy tummy on Monday morning so decided to try doing my 5 miles on the elliptical at home rather than risk going out and getting caught short! That was a mistake – hated every boring minute, didn’t manage the full distance and ended up with a bad case of DOMS the next day. Not doing that again! Got a thorough soaking on Thursday’s 5 mile run and discovered that a light wind-proof jacket is really only effective if not stuck to your body thanks to the pouring rain. Nice. Finally, on to my long run of the week. The Plan called for a step back to 14 miles, following last weekend’s 18 miles. This felt like a bit too much of a step back to me, though I guess it is all about being prepared for the final long run of 20 miles next week. To complicate matters, I woke up with a slight head cold – nothing too serious, sore throat and sniffles mainly, but enough to make me wonder whether I should run at all. I decided that it was probably OK to try and that I could always cut it short if things got rough. So when I set out I had no idea how far I was going to go. 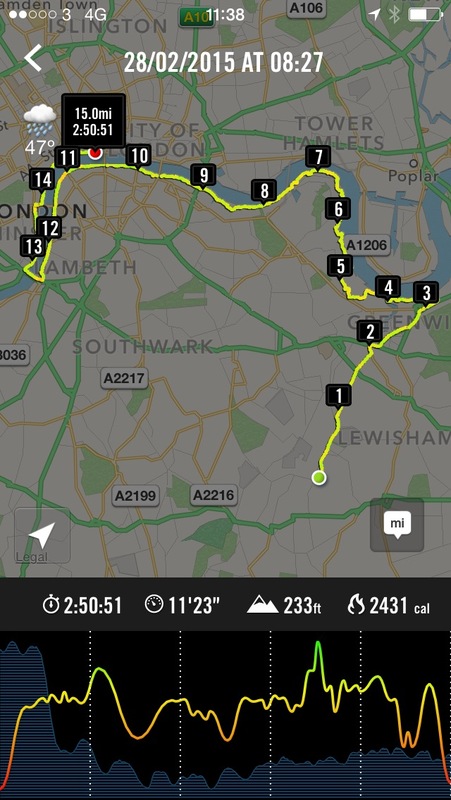 I felt really comfortable until I hit the Greenwich peninsula around seven miles in. 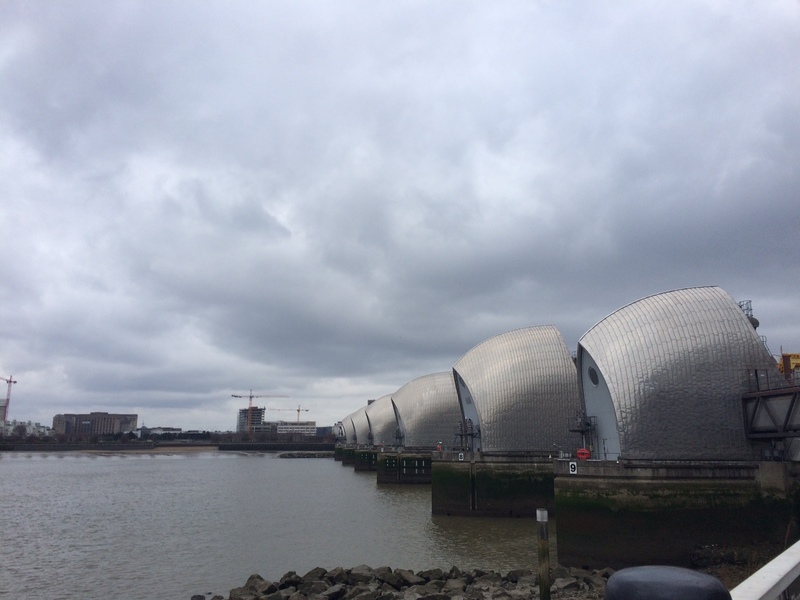 It was really windy yesterday and that part of the route is mega exposed (that was some exceptionally clever route planning on my part I think), so I felt the full force for a mile or so as I wound my way around the O2, which was exhausting. I gave myself a walk break at 8 miles to recover and after a few wobbly miles felt much stronger again by the time I hit 13 miles. I decided then that I’d try to get to 16 miles. It was a little further than The Plan called for, but I felt good enough to give it a go. And those last three miles were really good. A little frustrating in parts as I hit some very tourist heavy sections of the Thames Path between Tower Bridge and the Globe, but from a physical point of view I was really happy. I finished in just over 3 hours, so averaged a faster pace than usual for my long runs and was around my target marathon pace. A much better 16 miles than the one a few weeks back! Niggles. 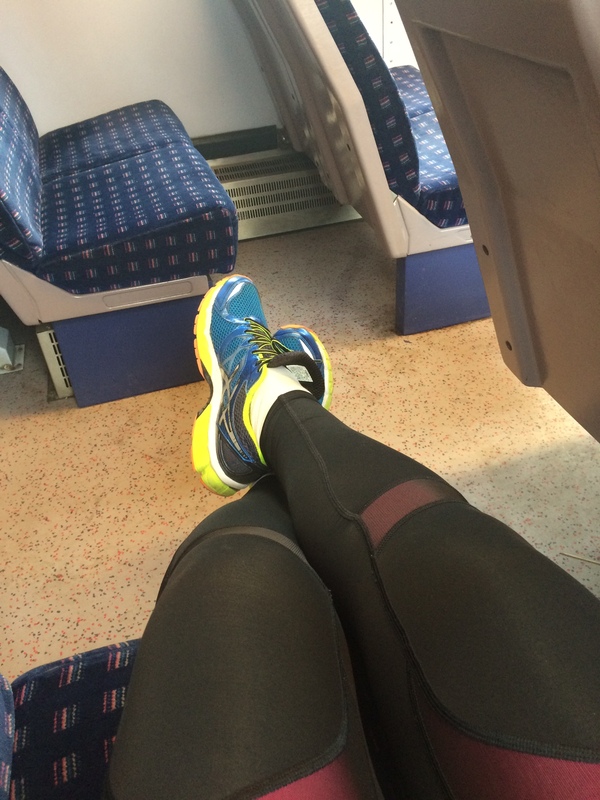 Having spent the past three months or so training for the marathon, I am getting increasingly paranoid about injury – in fact I’m now at the point where I’m more worried about this than the prospect of not being able to finish. Last week I noticed some pain in my inside left ankle as I was running. It was present for the first three or so miles of each of my mid-week training runs, but would ease off after a time. It was not severe enough to feel like I should stop, but it was noticeable, so I figured I’d keep an eye on it and see what happened. I thought it had sorted itself out when there was nothing in the early miles of the half last weekend, but then it appeared around half-way into the race and hung around for two or three miles. Hmmm. Then there was a bit of a panic when the pain appeared when I got up on Monday morning. Was this an injury? What do I do? Google ankle pain… Ahh – that way lies madness, stop Googling! After talking myself out of what was DEFINITELY either a stress fracture or tendonitis, I decided that the best thing to do was to rest it for a few days. I did think about going to see a physio, but felt that this would be better to do if the pain was still there after a day or so. I held off running until Thursday and when I went out that morning for a relatively brisk five miles, I’m delighted to say there was no sign of pain. Phew! I’m still keeping an eye on it and will head straight for the physio if it resurfaces, but panic over. For now anyway. Which was good, because I really needed to concentrate on the real task of the week. The first of the biggies. 18 miles. Isn’t it funny how your brain can work against you sometimes? Last week I ran a really comfortable half, but for some reason I started to struggle around mile 12 this week, despite running almost a minute slower per mile than last week’s race pace. I guess some of this was down to not having much miles in my legs this week and some of this was down to the mental barrier of 18 miles. And the windy conditions didn’t help. Either way, I had a fairly rotten time of it for about three miles, but then (thanks to a quick pit stop at Tower Bridge for an energy drink) things picked up again and my last three miles were much better and I felt good enough for a strong finish. 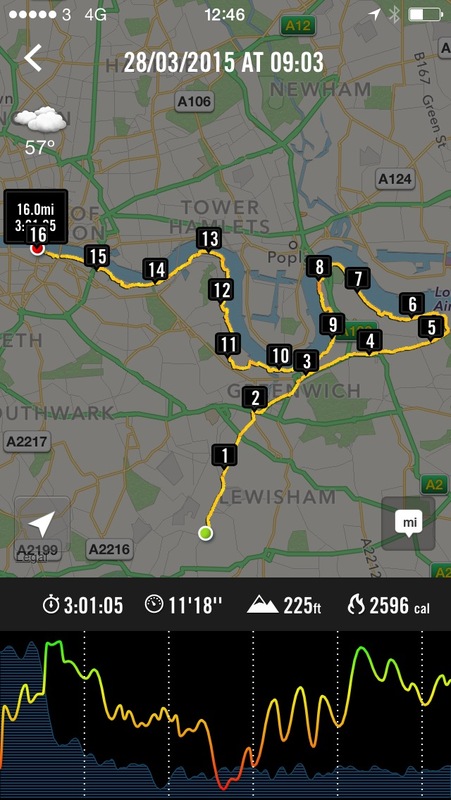 The Plan calls for another step back next week – 14 miles – I guess in preparation for the big 20 in two week’s time. That feels like a bit too much of a step back to me, so I might do 15 or 16, but we’ll see how it goes. The most important goal for the week is getting the mileage in during the week. I’d be lying if I said that medal wasn’t a MAJOR contributory factor in my decision to enter this particular half. 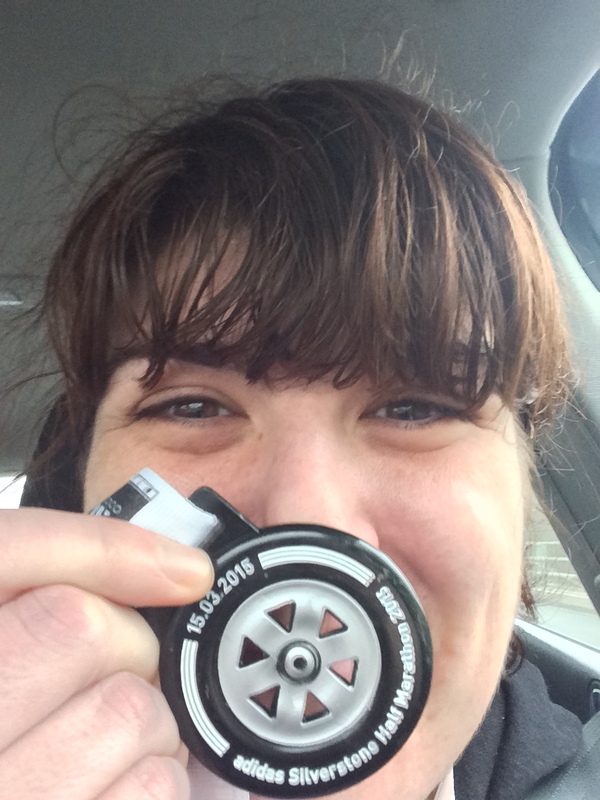 Yes, it fell perfectly in my training schedule and all that, but look at that medal! It was a decent race. 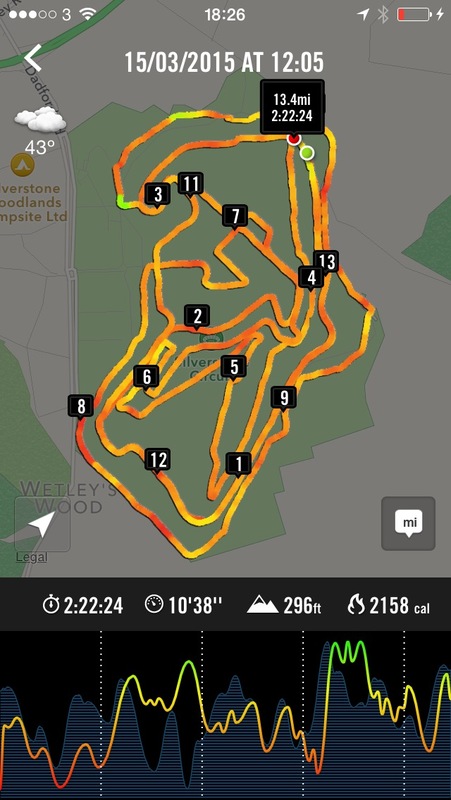 I wasn’t really sure how I wanted to run it – whether to treat it as a training run or a race. In the end I decided that the thing to do was to run it at my target marathon pace, but to drop the pace to more of a training run if I felt like I needed to. As it turned out I did neither of those things. I started out with one of the pacers (11:22 for a 2:28 finish time), but after about three miles I felt like I could probably go a little faster. I picked it up and ran really comfortably at around 10:40 or so for the rest of the race and even managed a strong finish. My finish time was 2:22:02, so not a PB or anything, but I’m really happy with it. I felt strong the whole way round and didn’t need to walk at all, which is brilliant for me. I didn’t even find it boring, as I was sure it would be. Bonus. So that was that. 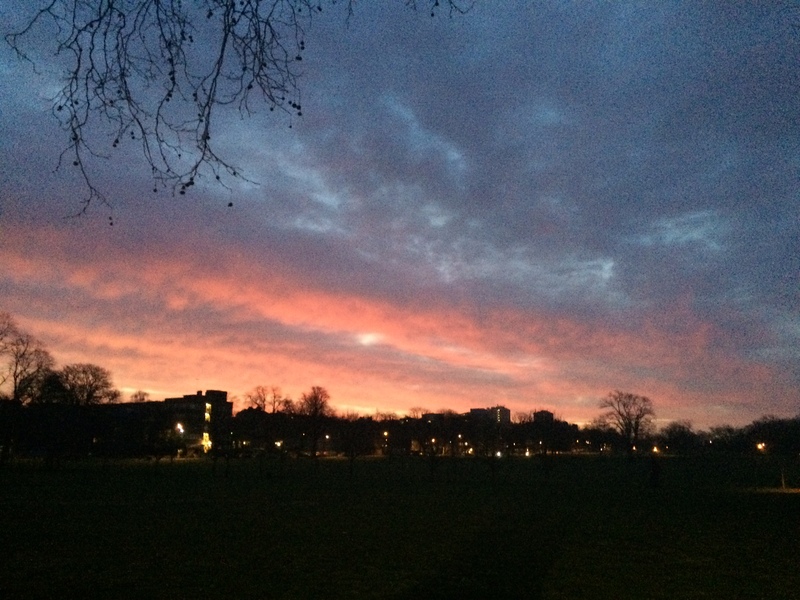 And it was the end to a great week of runs as it happens, made even more lovely by some glorious dawns over south east London. I’ve been feeling fairly smug about having avoided the lurgy that was running rampant this winter. Colleagues, friends and family were felled, one by one (and repeatedly), but, apart from a very brief spell of feeling a bit rubbish in January, I had so far not succumbed to this beast of a cold. Yay for me. Until this week. I noticed a bit of tightness in my chest when I went to bed on Monday night, but chose to ignore it and hope that a good night’s sleep would sort it out. I was planning to run in to work on Tuesday and, having missed so many runs last week after my fall, I was really reluctant to skip yet more runs this week. So when I got up on Tuesday with the tight chest having turned into a definite cough, I decided to break the ‘no running if it’s below the throat’ rule and run in to work anyway. I wasn’t feeling too bad and I figured that if it did get bad along the way then I could just jump on a bus. This may not have been a wise decision. 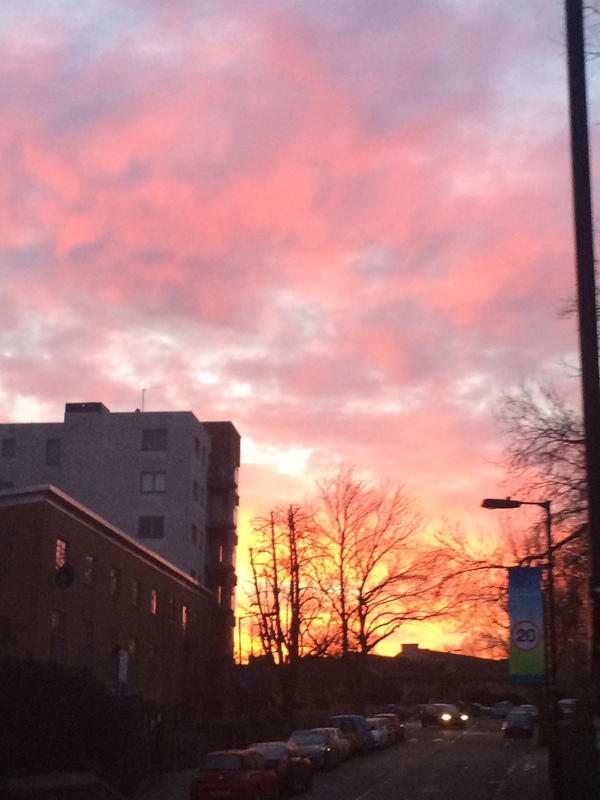 The run into work itself was not too bad. 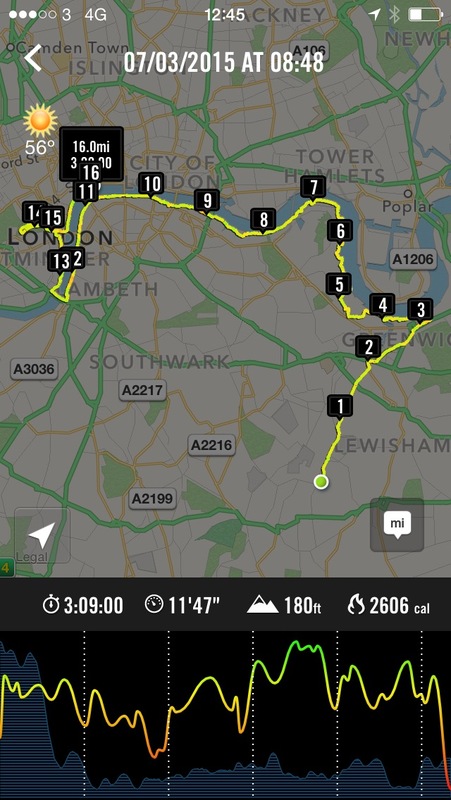 In fact, I managed my fastest time on this route this year. I didn’t feel horrible during the run and really thought that perhaps I’d manage to side step this cold as well. As Tuesday went on though I felt progressively worse, and by the time I went to bed on Tuesday night I was properly feeling sorry for myself. I spent the next few days in the grips of a cold and so I reluctantly admitted that the other week day training runs were off limits. Boo. Although it was almost certainly a mistake to run on Tuesday, perhaps it did do something to boost the white blood cells as I seemed to get over it pretty quickly, and by Friday I was feeling much better. I decided I was well enough for my planned long run on Saturday and set out for my 16 miles feeling confident. Well, it was a bit of a slog to be honest. I’m sure I was still feeling weak from the cold and, while the cough was (almost) gone and my nose was no longer blocked, I was tired and sluggish for most of the run. It was only a mile further than last week and it took me 20 minutes longer. Disappointing, but I’m not feeling too disheartened. I think it is clear why this run was so much more difficult than last week and I can still take a lot of pride in the fact that I managed to get out there and complete the distance, no matter how slowly. 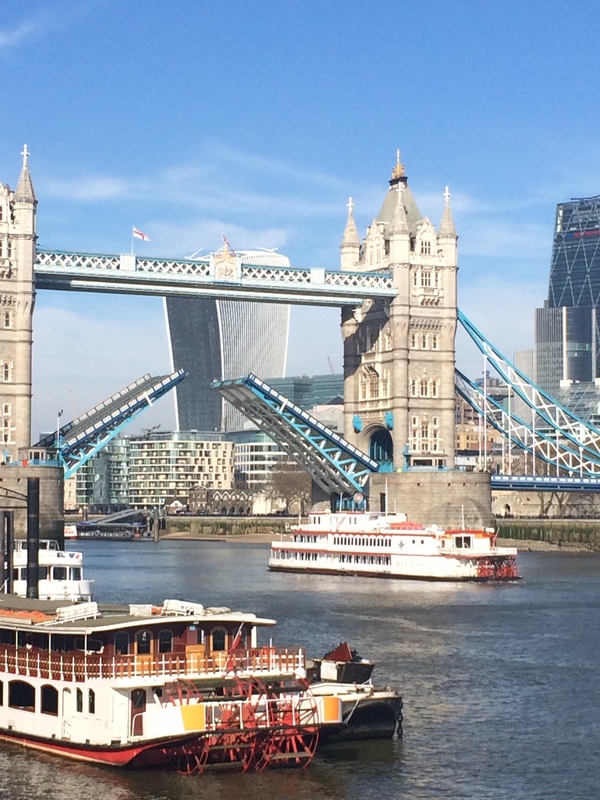 Long run photo this week: Tower Bridge in action! I fell over during one of my runs this week. In the four years I’ve been running, this was the first time I fell (which is surprising to be honest because I’m a bit clumsy and had a reputation for falling over a lot before I started running, but that’s by the by). It wasn’t as bad as it could have been – it was very early on into the run, so I had been going at a gentle warm-up pace and was able to hobble home very easily. My injuries were also minor: a scabby knee and bruised wrist mainly, although my calf cramped up during the fall and that took a few days to stop hurting, which made me worry I’d done more damage than initially thought. I blame a combination of wonky pavements, busted streetlights and a momentary lapse in concentration. So because I was mega paranoid about causing further damage and because my calf and scabby knee were quite painful, I decided to rest up and not do any running until everything had stopped hurting. This meant no shorter week-day runs, but by Friday evening I was sure that I was OK to go out for my long run. This week was one of the buffer weeks I’d built in to The Plan and the long run was a repeat of the 15 miles that had been my nemesis a couple of weeks ago. There were some mental demons that needed showing the door – it was really important to me to nail this distance and stop feeling like the whole marathon thing was beyond my ability. When people say that running a marathon is as much about mental toughness as physical strength they really aren’t kidding! A new strategy was thus employed. In addition to properly focussing on maintaining an even, slow pace, I tweaked my refuelling plan and decided on some mantras that I’d keep in my head as I took on the distance. And it worked! Instead of refuelling every five miles, I decided to go for a little and more often approach, taking something in every 30 minutes or so. I also decided to walk at these points, even if I felt like I didn’t need to, just to make sure I was also taking on enough water. 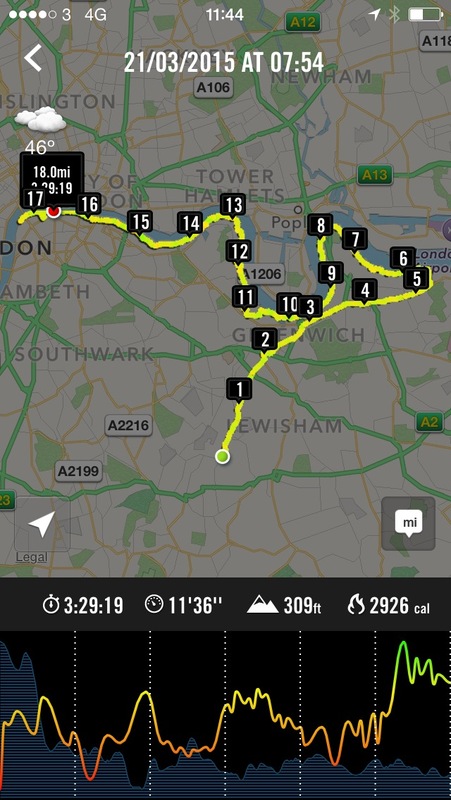 These really short, regular walk breaks meant that I felt reasonably comfortable for pretty much the whole run and I had no need to walk at any other point (apart from an annoying section around Westminster Bridge which was tourist gridlock, but that’s my fault for choosing to run there). My pacing was pretty good (for me), and I was able to pull myself back when I felt my speed pick up in mile 10. I managed to run the second half faster than the first half and my final mile was my fastest, which I was really pleased with. I wasn’t aiming for progressive miles (and didn’t achieve them), but this definitely worked much better than going out faster and running out of puff by mile eight. The mantras worked well too. There were times when repeating them in my head wasn’t enough and I had to say them out loud, which made me feel a little silly, but I think I was only overheard the once, (by a slightly bemused souvenir seller on the Embankment), but telling myself that I was strong and that I could do this really helped get me through some of the tougher bits. I’ll take feeling slightly silly over feeling completely defeated. So this week I picked myself up in more ways than one. It’s now March. The marathon is NEXT MONTH and I am back to feeling like I really can do this. I’ll leave you with the one picture I took on yesterday’s run. 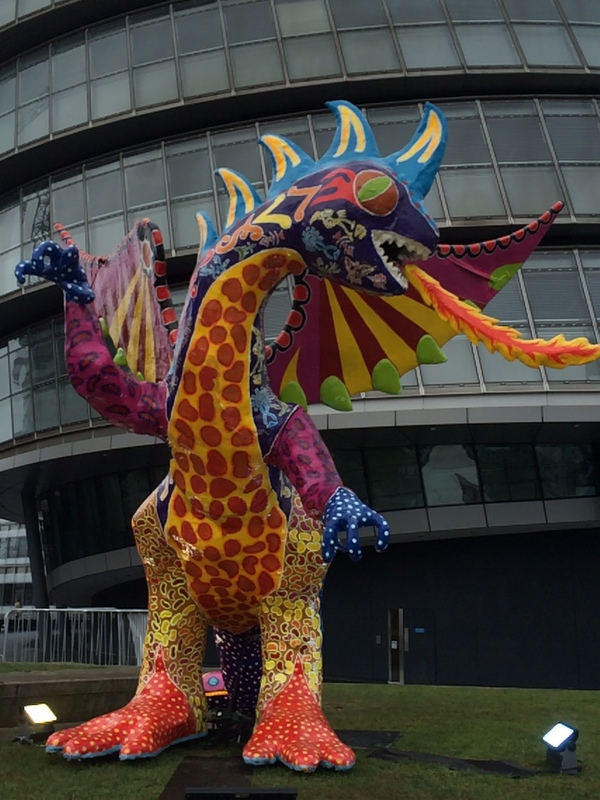 They were doing some sort of Mexican promotion thing on the South Bank by Tower Bridge and I fell in love with this colourful dragon outside City Hall.